The agency called out an Associated Press reporter over the weekend. 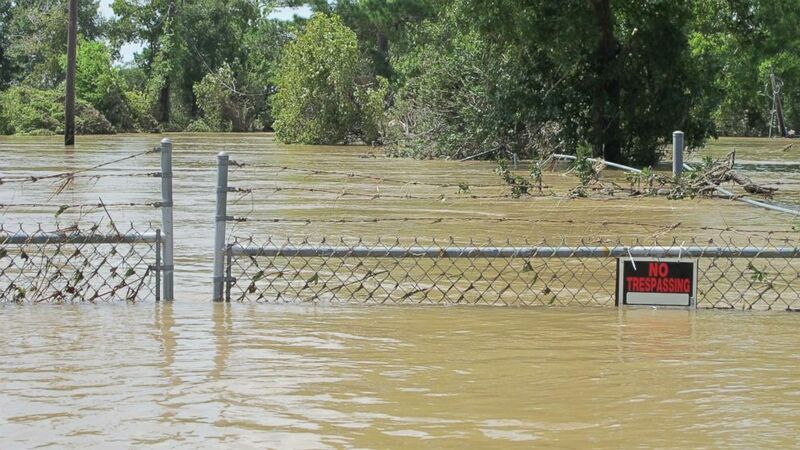 camera (Jason Dearen/AP) The No Trespassing sign on the barbed-wire fence encircling the 3.3-acre Superfund site barely peeked above the churning flood water from the nearby San Jacinto River, at the Highland Acid Pits, Aug. 31, 2017 in Highlands, Texas. The Associated Press is defending itself after the Environmental Protection Agency called its reporting on so-called Superfund sites in Texas into question over the weekend, criticizing one journalist for "reporting from the comfort of Washington." Hurricane Harvey has damaged or flooded at least 13 sites identified by EPA as contaminated by possibly dangerous materials, raising concerns that the materials could spread and pose a danger to public health. Local and federal EPA officials have been on the ground working to test and help restore the water supply after the storm. But on Friday the AP reported that the EPA was "not on scene" at flooded "ultra-polluted Superfund sites," according to its initial alert, prompting EPA to question the accuracy of the story and even attack one of the reporters by name. The AP story originally said reporters visited five Superfund sites. As of Monday, the AP said it has surveyed seven sites in and around Houston. EPA's Superfund program works to clean up some of the most contaminated sites in the country. There are 53 such sites in Texas that the EPA lists as a priority because of known releases of dangerous substances that could contaminate water or soil in the area around them. The EPA's regional office in Dallas was working to secure Superfund sites ahead of the storm, according to a statement from EPA on Aug. 24. Shortly after the AP story was published Friday, EPA said it was inspecting flooded sites as quickly as it could access them. We are inspecting flooded Superfund sites as quickly as our personnel can access them as the floodwaters recede. Then on Saturday, EPA said in a statement that 11 sites were inaccessible and would be inspected when the flooding went down, which the AP cited as confirmation of its reporting. That statement said the EPA had assessed 41 sites using aerial images and determined 13 sites were flooded. Two sites near Corpus Christi were inspected and EPA determined they did not need emergency cleanup but said it would continue to monitor the area, according to the statement. A follow-up statement from the EPA administrator's office on Sunday went after one of the AP reporters involved in the story by name, though two were listed on the story, saying he wrote an "incredibly misleading story" and criticizing him for "reporting from the comfort of Washington," even though the story cited reporters on the ground and AP published video Friday from a reporter who visited one of the sites near Houston by boat. In a statement Sunday, AP Executive Editor Sally Buzbee defended the reporting, saying, "We object to the EPA's attempts to discredit that reporting by suggesting it was completed solely from 'the comforts of Washington' and stand by the work of both journalists who jointly reported and wrote the story." Responding to ABC News' request for comment today, EPA said, "With regard to the statement made about the AP, we felt that it was important to bring attention to the misleading and biased story -- and the history of that bias. ... EPA has about 145 personnel and TCEQ has about 500 people supporting the response efforts for Hurricane Harvey and have established a Unified Command with other state and federal partners, and are in the field conducting work." EPA added regarding Superfund sites: "Teams are in place to investigate possible damage to these sites as soon flood waters recede, and personnel are able to safely access the sites." EPA also stated that the AP made no request to the agency to tour Superfund sites in Houston. ABC News is touring some Superfund sites in Texas with EPA today. EPA Administrator Scott Pruitt has said that Superfund cleanup has been too slow in the past. In May, Pruitt announced a new focus on cleaning up contaminated sites and said in a statement that EPA "will be more hands-on to ensure proper oversight and attention to the Superfund program at the highest levels of the Agency." ABC News reached out to the AP for comment but did not immediately hear back.